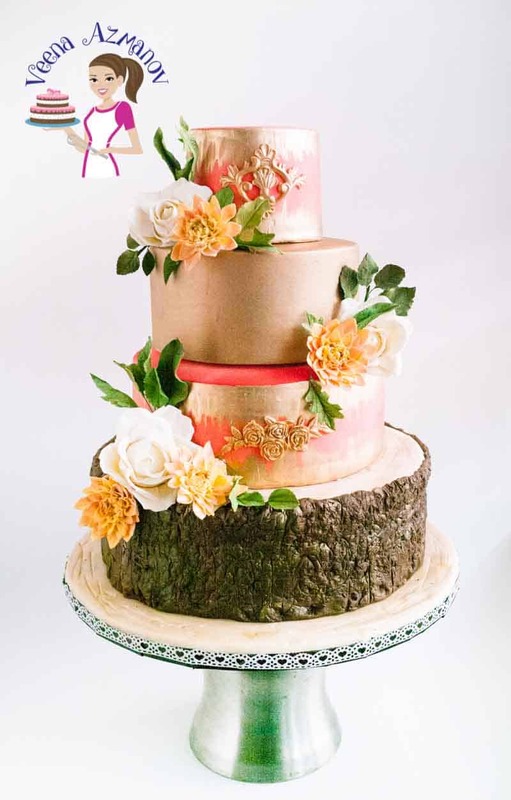 This Dahlia Gold wedding cake is four tiers of deliciously flavored cake from creamy coconut, chocolate fudge to Zesty lemon and moist carrot goodness. 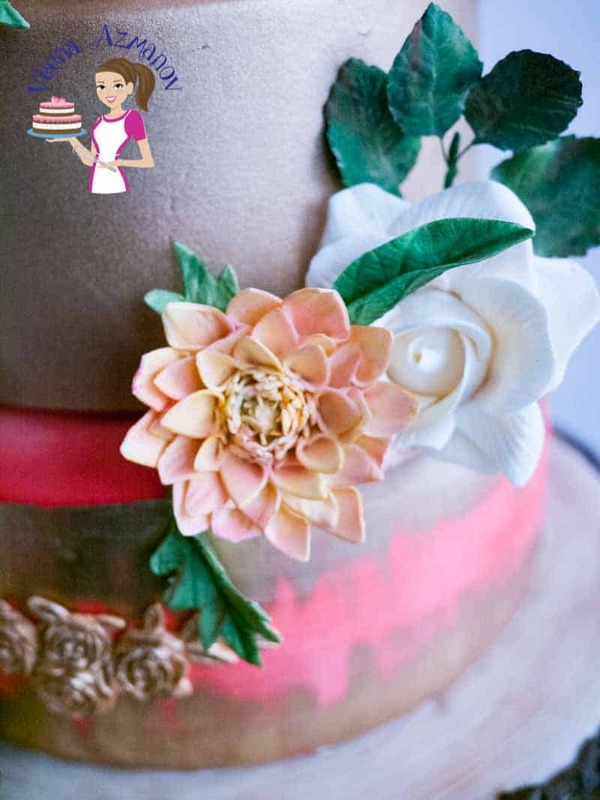 Covered to perfection and adorned with sugar Dahlia, roses and foliage. I made this cake for a bride that flew all the way from the US to celebrate her wedding here with her family. The couple actually got married last year and were suppose to come here to celebrate their wedding with the family; so this cake was an order from last year. Some family problems resulted in them having to postpone the wedding celebration until this year. This bride picked some of my favorite cakes from my online shop Calculated Cake Recipes. Now, unless you are a cake decorator who needs calculated recipes for cakes you not need to buy any of these recipes. I do have some of these recipes in the free section of my blog too. Just look under Recipes – cake and cheesecake recipes. A few details on how I did the cake. 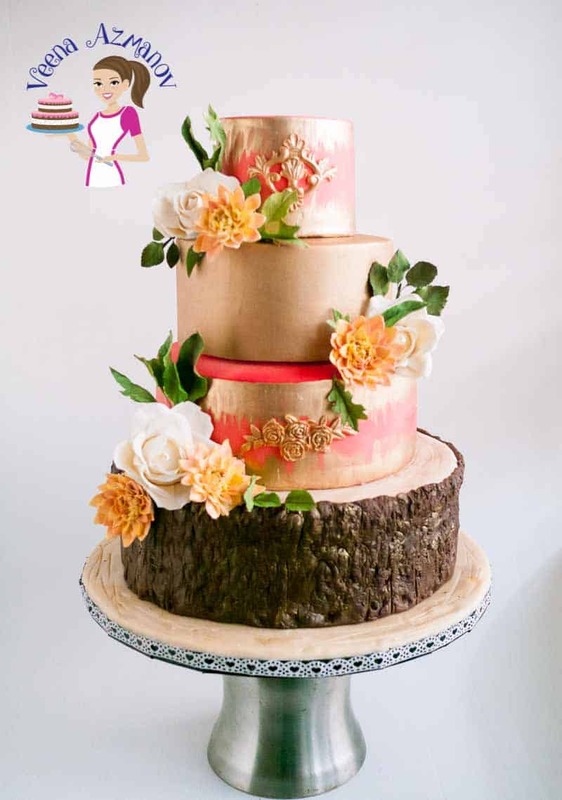 The bottom tier texture is made with a bark wood fondant silicon mold. Then dusted it to add more character. 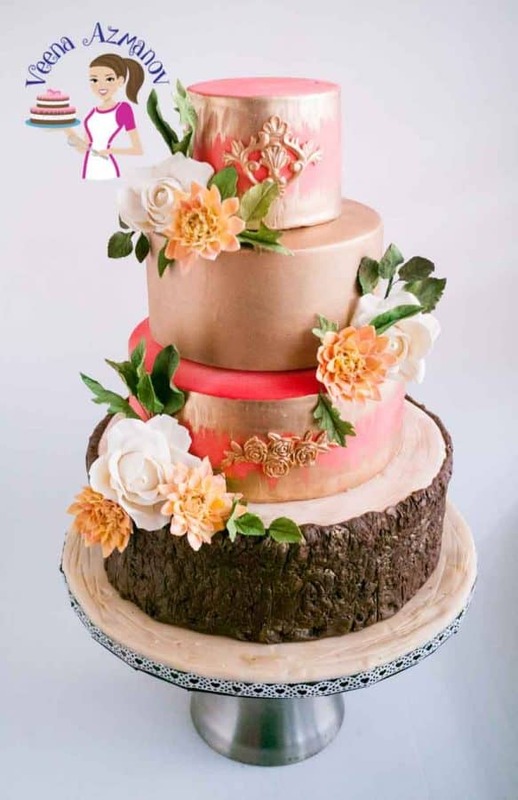 The gold on the second cake is Magic colors edible gold and the other two tiers it’s non edible gold but with the permission from the bride. To achieve this Rose Pink I actually used a Magic Colours Extra Red. Just a tiny bit will give you this beautiful rose red. The roses were not ordered by the bride but – just I felt it needed a bit more than just the medium size Dahlia the bride ordered. So I added the those quick large roses to give a bit of volume. The sugar Dahlias were made last year actually. I was all set to make the wedding cake when it was postponed about two weeks before the celebration. They were made with the same Nicholas Lodge Gumpaste Recipe I have here on my blog. Timeline for decorating this cake. I have been getting a lot question on when to decorate a cake and how many hours to charge for pricing a cake. 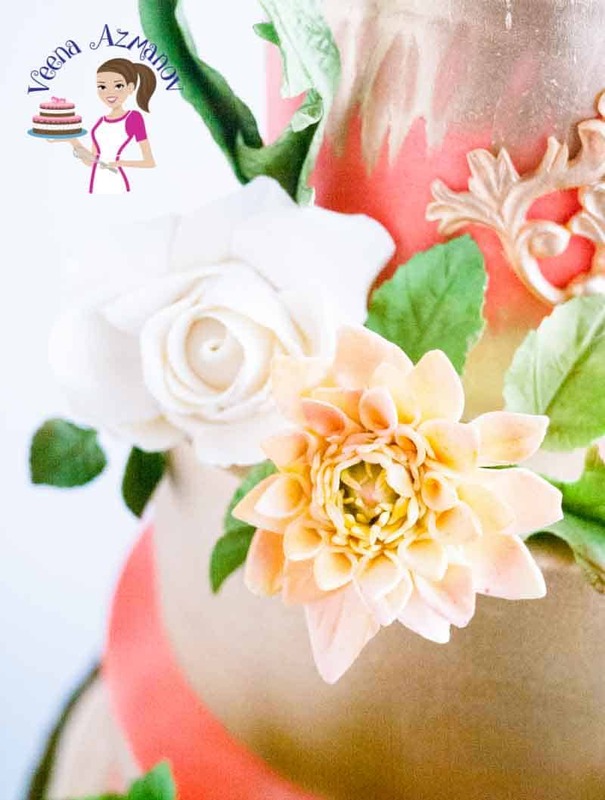 We have already spoken about this at length about both these tops on this blog – Timeline for decorating a cake and How to Price your cakes a Beginner guide. Just to take that further – I’m adding the time line and process I used for this cake as well as the approximate hours I calculated. I know it’s helpful to those of you that are new. On the whole this was a pretty simple and elegant cake just the way the bride wanted. Nothing too flashy or textured. So the basic of any cake making is all you need to make this cake really. Delivery – Day Four – Approximate work time on cake about 30 plus hours. Note – The work time is only for decorating the cake and does not include a lot more that goes into the process – such as preparing frosting, shopping for ingredients, designing the cake. We spoke about this in our post – I bet most you use are under pricing your cakes.